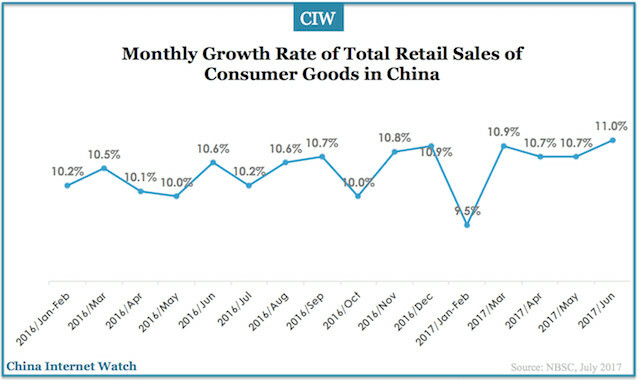 In June 2017, the total retail sales of consumer goods in China reached RMB 3.9 trillion ($440 billion), up by 11.0% year-on-year, China Internet Watch is reporting. That is approximately the same amount Greece was loaned over a five year period for its bailout ($440 billion), meaning the amount of money Chinese consumer spent on consumer goods for one month equals what Greece spent in five years. From January to June 2017, the total retail sales of consumer goods reached 17.2 trillion RMB ($2.5 trillion), up by 10.4% year-on-year. In the first six months of 2017, China’s national online retail sales of goods and services was 3.1 trillion yuan, an increase of 33.4% year-on-year and accounting for over 18% of total retail sales. As Chinese consumers’ spending largely depends on mobile payments, a total of $3 trillion in transactions using AliPay and WeChat Pay was recorded in 2016. The online retail sales of physical goods were 2.3 trillion yuan, an increase of 28.6%, accounting for 13.8% of the total retail sales of consumer goods. This indicates a huge market for luxury brands and consumer facing startups to open online retail market and adopt mobile payment options. From January to June, the retail sales of consumer goods in China’s urban areas was 14.7 trillion RMB up by 10.1%, year-on-year; while that in rural areas was 2.4 trillion RMB, up by 12.3%, year-on-year. China now sees a new stream of unmanned stores started out by both early stage startup and internet giant. China’s unmanned convenience store BingoBox received RMB 100 million ($14 million) in a Series A from GGV Capital, with its plans to reach 5,000 stores by the end of this year. Alibaba also featured its cashier-less concept shop in July, powered by its face recognition technology.